Keetsa Plus Mattress Review - Comfort Like No Other! Keetsa Plus Mattress Review – Comfort Like No Other! A good night’s sleep is one of the most important and vital needs of a healthy life. Lack of proper sleep is one of the most common reasons that affect health and productivity. The only way to ensure an active lifestyle is to give the body the time that it needs to rest and refresh itself. But what if you sleep for the required number of hours and yet still feel sleepy, drowsy, and tired all the time! That means that the problem lies not in your sleep pattern but your mattress! While we advocate the need to sleep around 6 to 8 hours every night, if your mattress is the reason behind your droopy eyes and tired behavior, then you need to do something about it fast! An uncomfortable mattress can ruin your sleep just like a simple pea wouldn’t let the princess sleep in the famous story because she felt something hard underneath all the mattresses piled on her bed. Though you’re not a princess, an unsuitable mattress can not only ruin your sleep but also expose you to the risks of severe back and neck pain! If you don’t want to add pain to your sleepless nights, then find the right mattress now! And the KEETSA Plus mattress is just the thing you need! The importance of a mattress cannot be stressed enough. Your body needs rest just like any other machine. And if you believe that your body can rest while being placed on a highly uncomfortable mattress, then you can say goodbye to any sweet dreams forever! To enjoy a refreshing night’s sleep, nothing is more important than a proper mattress. Your mattress should be soft and must provide support to the body. The KEETSA Plus is a great choice! What Is The KEETSA Plus? The KEETSA Plus is a mattress which will make you feel as if you are lying on a bed of clouds! The expertly designed mattress is a solution to the worries of poor souls who have been deprived of a comfortable night’s sleep by their abominable mattress! 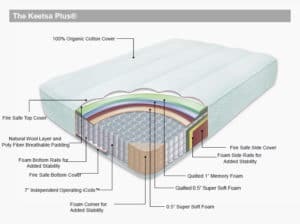 The KEETSA Plus mattress is a product manufactured on a unique and innovative design. The core of the mattress has been designed with separate coils that provide support to the body with the responsive and supple flex. These coils are called as iCoils. Being independent coils, they reduce the chance of discomfort caused by movement in the mattress while being used by multiple people. An innovative technology geared to provide maximum comfort! KEETSA Plus is an EverGreenTM product, which has been made from all-natural tea. This fresh and natural ingredient has been embedded into the mattress itself so that it remains fresh for a long time without any need for any chemical ingredients. The mattresses are designed to reduce the carbon footprint in the environment. The packaging is environmentally safe, as are the ingredients used in the manufacture of the mattress itself. KEETSA Plus mattress is a safe and comfortable solution for new mattress seekers! Maximum sleeping comfort with innovative design mattress manufacturing technology. iCoil design which provides supple support to all important body parts and ensures comfort. Independent coil placement in the mattress reduces the discomfort caused by excessive movement. EverGreenTM ingredients which are environmentally safe. Use of natural green tea extract to keep the mattress fresh for a long time without the need of any artificial or chemical products. An affordably priced world class quality mattress. A KEETSA product with a decidedly low carbon footprint, thus being more environmentally safe. A high quality and comfortable memory foam mattress layer. It is a non toxic and eco-friendly mattress choice. The mattress is made fire resistant. Who Will Need A KEETSA Plus? If you value your health and wish for an active and fit lifestyle, then you should definitely opt for a KEETSA Plus! An uncomfortable mattress can be the ruin of your sleep, comfort, and body. While you lay tossing and turning trying to find a comfortable spot on the mattress, after a time your neck, shoulders and neck will start throbbing with pain, driving sleep away for sure. The memory foam of the KEETSA Plus has a silky smooth soft top layer, while the independent coils placed inside the foam ensure the needed support to the body at all times. 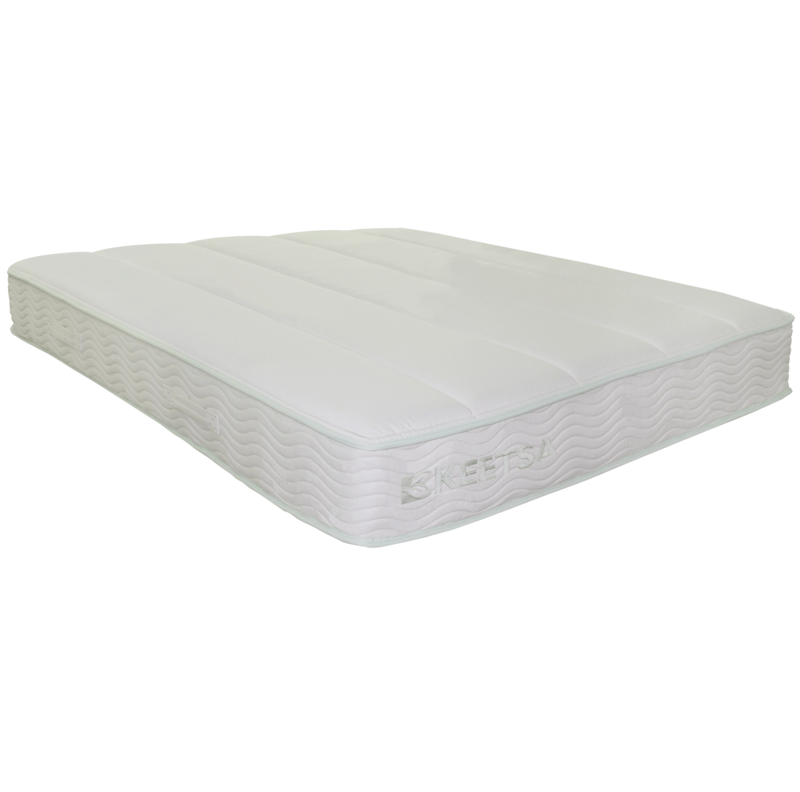 The mattress contours to the body shape and cradles the pressure points for supple and comfortable support. This environment friendly, low carbon footprint, highly comfortable and innovative design mattress is the answer to the worries of tired sleepers troubled by their uncomfortable bed mattresses.